With home prices falling once more, recovery in housing markets could be farther off than anticipated, and residential investment could prove more of a [economic] drag than initially foreseen. Federal Debt Held by the Public, a better measure of the national debt because it doesn't count money some parts of the government owe to other parts of the government, is just shy of $8.5 trillion according to TreasuryDirect.gov. 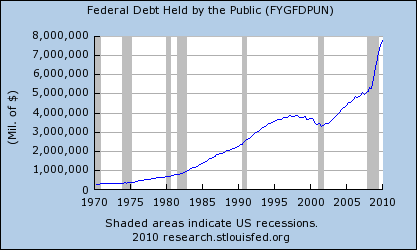 To put things in perspective, that's $75,973 per U.S. household. Home prices fell in the first quarter of 2010 but are still higher than they were a year ago. According to the S&P/Case-Shiller nation-wide index, home prices fell 3.2% quarter-over-quarter but have still managed to climb 2% year-over-year. "The housing market may be in better shape than this time last year; but, when you look at recent trends there are signs of some renewed weakening in home prices," says David M. Blitzer, chairman of S&P's index committee. Brad Hunter, who follows the housing market for Metrostudy, a consulting and data-providing company, is predicting further price erosion along the lines of 10% or so before the market fully bottoms out. Government intervention paused the fall in housing prices over the past year, but now that the tax credits are gone I expect the free market to continue pushing prices lower. New home sales soared in April as homebuyers rushed to claim the tax credit that expired at the end of the month. April was the second straight month of increases. In March new home sales snapped a four-month losing streak and surged at the fastest single-month rate in 47 years as homebuyers snatched up properties ahead of the looming deadline for the tax credit. The homebuyer tax credit, which expired April 30, boosted sales since buyers had to sign contracts by the end of last month. Now that the tax credit has expired, the temporary boost in home sales is likely over. After all, who wants to be the sucker who buys his house on May 1? Americans purchased homes at a surprising clip in April, but don't let that fool you into thinking the housing market is back. Although economists were expecting a month-over-month increase of 5.5%, the National Association of Realtors reported yesterday that sales of previously owned homes rose an unexpected 7.6%. That continued a yearlong rise in housing activity and marked the highest number of sales recorded since November of last year. But prospective home buyers, particularly those tempted to think of real estate as an investment again, should tread with caution. One critical obstacle to a housing recovery remains intact: supply. Until the number of empty homes starts to shrink, prices could still fall further. Many defaults have yet to be figured into the housing market because banks are sitting on them or they are being held back due to government programs like the federal Home Affordable Modification Program. ... At some point these homes will go on the market, further depressing prices. "Although risks involving Europe have recently escalated, the outlook in this country has improved in most respects," said NABE President Lynn Reaser, chief economist at Point Loma Nazarene University. "Growth prospects are stronger, unemployment and inflation are lower, and worries relating to consumer retrenchment and domestic financial headwinds have diminished," she said. Judging by the slope of the Treasury yield curve, I too expect decent economic growth over the coming year. 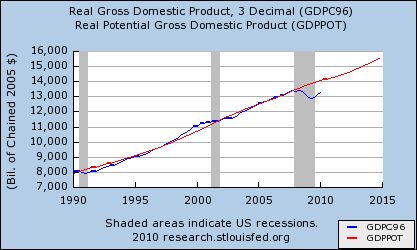 That said, the economy fell so far during this recession that it will take a long time to get back to potential GDP. 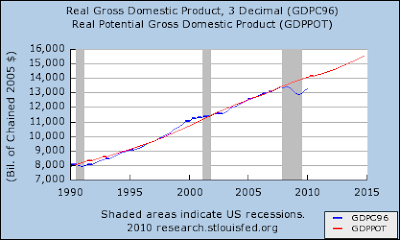 Luckily, real GDP is currently growing faster than potential real GDP, which is needed if we want the economy to get back to normal. Beginning June 1, your lender is likely to order a second full credit screening immediately before closing. The last-minute credit report will be designed to find out whether you have obtained — or even shopped for — new debt between the date of your loan application and the closing. If you've made applications for credit of any type — for furnishings and appliances for the new house, a car, landscaping, a home equity line, a new credit card, you name it — the closing could be put on hold pending additional research by the lender. If you've actually taken out new loans that are sizable enough to affect the debt-to-income ratio calculations used in your original mortgage approval, the whole deal could fall through. The added debt load could render you ineligible for the mortgage because you suddenly appear unable to handle the payments without a strain on your household budget. The June 1 changes are part of a new effort by mortgage giant Fannie Mae to cut down on slipshod underwriting by lenders and fraud by borrowers. Fannie's "loan quality initiative" will require lenders not only to pull two credit reports for each mortgage transaction but to perform additional verifications of borrower occupancy plans for the property, Social Security numbers and Individual Taxpayer Identification Numbers. The idealized vision of suburbia as a homogenous landscape of prosperity built around the nuclear family took another hit over the past decade, as suburbs became home to more poor people, immigrants, minorities, senior citizens and households with no children, according to a Brookings Institution report to be released Sunday. Demographers at Brookings say suburbs are developing many of the same problems and attractions that are more typically associated with cities. And cities, in turn, have been drawing more residents who are young and affluent, so the traditional income gap between wealthier suburbs and more diverse cities narrowed slightly. The report outlines a decade in which several demographic milestones were passed as the nation's population topped 300 million midway through. About two-thirds of Americans live in the nation's 100 largest metropolitan areas, virtually all regions with populations of 500,000 or more. "We think we're a small-town nation," Berube said. "But small towns exist because they're connected to something bigger, which allows residents to make a living." Suburbs already are facing a rising tide of poor residents. Over the past decade, the number of suburban poor increased 25 percent, almost five times faster than the urban poor growth rate. For the first time, suburban poor outnumbered urban poor by 1.5 million. However, suburbanites were far more likely to have incomes just below the poverty line, while residents of cities were more likely to be in deep poverty, with incomes less than half of the poverty level. In what the report calls a cultural generation gap, the nation's young are racially and ethnically diverse, while the older population is more white. As far as I'm concerned, you will usually have free speech on this blog, but if you are nasty toward others, post link spam, or I suspect you are either trolling or engaging in sockpuppetry, I may delete your comment. If you want to hold other commenters accountable for their previous statements on this blog, then at least have the courage to choose a consistent and unique username for yourself (other than "Anonymous") so you can be held accountable as well. If you make snide remarks towards others, your comment may be deleted. If your comment is offensive or disagreeable in general, your comment may be deleted. If you attempt to hold others accountable for their previous statements while you cowardly hide behind the username "Anonymous", your comment will definitely be deleted. If you post link spam, I will delete your comment. If I suspect you are either trolling or engaging in sockpuppetry, I may delete your comment. All suspected link spam will be deleted. 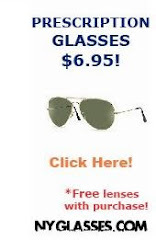 Link spammers frequently post comments on this and other blogs. Since most blogs use nofollow tags in the comments section, link spammers are mostly wasting their time. However, their actions are still annoying for blog owners and blog readers. Link spammers often try to make their comments look legitimate, which can make it difficult for me to distinguish between legitimate and illegitimate comments. Thus, I may sometimes unintentionally delete legitimate comments when they contain links to other websites. Suspected trolls and sockpuppets may be deleted. I find it extremely difficult to distinguish between trolls and regular commenters who just happen to be disagreeable. Sockpuppets are also hard to spot. I will try to err on the side of free speech, but I may occasionally delete a legitimate comment that appears to be from a troll or sockpuppet. The easiest way to avoid having a comment deleted is to be nice. Mr. Baker’s concern that Freddie may be racking up losses by overpaying for mortgages derives from his suspicion that the government might be encouraging it to do so as a way to bolster the operations of mortgage lenders. That would make Fannie’s and Freddie’s mortgage-buying yet another backdoor bailout of the nation’s banks, Mr. Baker said, and could explain the government’s reluctance to include them in the reform efforts now being so hotly debated in Washington. Here's a good long interview with Lloyd Blankfein, the CEO of Goldman Sachs, from last week's episode of Fareed Zakaria GPS. Fareed Zakaria GPS airs Sundays on CNN at 10:00 AM and 1:00 PM. The show is highly recommended for anyone interested in government policy and international relations. Zakaria has a PhD in Political Science and is far more knowledgeable than most Washington journalists. Some economists trip all over themselves to prove that bubbles can't happen. Update: Dean Baker points out more flaws in Professor Mulligan's reasoning. “It isn’t that low interest rates don’t boost housing prices. They do,” write Glaeser, a professor of economics who directs the Rappaport Institute and the Taubman Center, and his colleagues, Joshua Gottlieb, a doctoral student in economics at Harvard; and Joseph Gyourko, a professor of real estate at the Wharton School. You might want to take what these economists say with a grain of salt. Edward Glaeser is associated with Harvard's Joint Center for Housing Studies, which routinely denied the existence of the housing bubble until it burst, although to be fair, his name never appeared on any of the annual studies that denied the bubble's existence. It does suggest, however, that Harvard economists are not the cracker-jack financial wizzes that they are supposed to be. CNBC's Diana Olick has more on this study. I have long believed that fundamental factors spark all bubbles, but then a get rich-quick-mentality takes over in the minds of buyers as they watch asset prices rise. As they buy up assets in a quest to chase the market, this increased demand pushes prices up even more, which then convinces more people that they can get rich quick by jumping in. Thus a feedback loop develops where the get-rich-quick mentality becomes a self-fulfilling prophecy, until something finally breaks the cycle. Then the cycle reverses itself. I believe this is how all bubbles happen, not just housing bubbles. However, I have been attacked by many Bubble Meter readers for this belief that buyers largely have themselves to blame for the bubble. Despite the fact that bidding wars often broke out during the bubble, in which buyers frequently bid above the asking price of the house, it is far easier for people to lay all the blame on a small group of Wall Street bankers than spread the blame over a large swath of the American public. If Glaeser et al's study is correct, it doesn't mean that credit market policies are blameless for the bubble. However, the major factor in the growth of the bubble, which they were unable to identify, could easily be the get-rich-quick feedback loop. This type of short-term irrationality is something that traditional economic theory does not recognize. Economic man, after all, is purely rational. Fannie Mae on Friday said it will tighten lending standards on adjustable-rate mortgages and "interest-only" loans that helped fuel the housing bubble and have led to a disproportionate share of losses for the mortgage-finance giant. The changes, which will take effect in September, will require lenders to qualify borrowers based on whether or not they can afford potentially higher payments once adjustable-rate loans reset, and will require much more stringent criteria for interest-only borrowers. Freddie Mac said earlier this year that it would stop buying interest-only loans in September. Fannie said it will continue to offer such loans, but it will require borrowers to have credit scores of at least 720 and 30% equity. Borrowers must also have at least two years worth of cash reserves remaining after closing. For adjustable-rate mortgages that reset within their first five years, lenders will have to qualify borrowers under higher payment levels, using the greater of either the current interest rate plus two percentage points, or the current interest rate plus the extra margin charged by the lender. 'bout time. How long ago did the financial crisis start? The home buyer tax credit is no more. Most experts I talk to, including the Realtors' own economist, believe we may see another dip in sales and prices before we are really on the road to recovery. For anyone who's interested, Goldman Sachs CEO Lloyd Blankfein is being interviewed on CNN's Fareed Zakaria GPS right now. It re-airs at 1:00 PM ET.